At RR Frames, our lives revolve around two things...family and cars. We're committed to bettering the functionality of both and inspiring others to do the same. We are the premier builder of modified Chevrolet frames and we work relentlessly to provide our customers the best possible products and service for their classics. We take great pride in earning your trust, supporting our community and forming meaningful, lasting relationships with our customers. Our niche market allows us to focus on the vehicles below. We certainly aren't limited to these vehicles but they are our specialty and our brand was built on servicing these vehicles. Our goal is always to make your classic feel and drive like new and our track record to make that happen is spotless. Give us a call and let us work our magic! Classic trucks back from the brink...hard to beat the vintage muscle style of America's best-selling truck from the 1st Series advance-design Chevy pickup era. The "solid-axle" generation Corvettes capitalized on the public's enthusiastic reaction to Chevrolet's concept vehicle and they are absolutely stunning. The C2 and C3 models are often referred to as the 'mid year' Corvettes. They have an amazing body style which remains popular today. The small-block V8 changed the motorsports industry. The "Tri-Five" era dominated showrooms and races everywhere. Browse our proud owner's hot rods, and check out the stance of what yours would sit like! Rick is featured in the cast of Hot Rod Hunt as the Scoutmaster, the kingpin that keeps the Hot Rod Hunt troop together. Rick is truly a classic car lover that always looks for the story behind each and every automobile he works on/restores. We want your old classic to drive like new. We take the original frame rails and place them on our jig. We weld each piece one by one so that the C4 corvette suspension bolts right in. The modified frame comes with the cross members, torque arm and is sandblasted so that you can begin to assemble it. We will walk you through putting it together or we can build you a rolling chassis. Rick Moore started RR Frames with the goal of building quality frames for 1955-57 Chevy cars, 1947-59 Chevy pickups, 1953-82 Corvettes, and 53-56 Ford pickups. The business is an evolution of his love of cars. 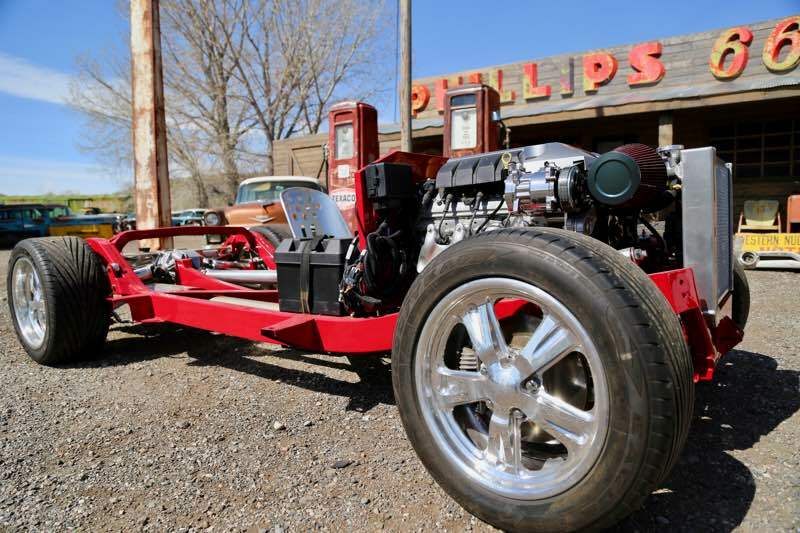 Rick has always enjoyed restoring old cars and is a fantastic welder. His eye for detail is also very evident as he is meticulous with body work and paint. RR Frames is a family-owned and operated business located in Belfry, Montana at the foothills of the beautiful Beartooth Mountains. Rick and his wife, Casey, have two children, Alex and Ricky. If you happen to stop by, you will likely meet them all. Copyright © 2017 RR Frames, Inc. All Rights Reserved.